Thinking about having a bullet journal holiday theme for the best time of year? 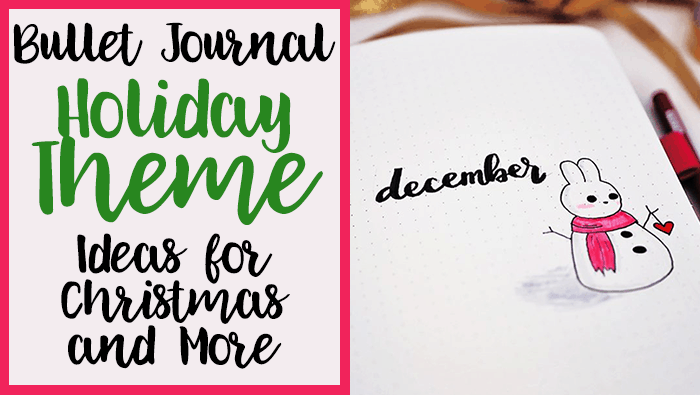 Then this post is just for you, with lots of great bullet journal monthly theme inspiration for Christmas and holiday joy. 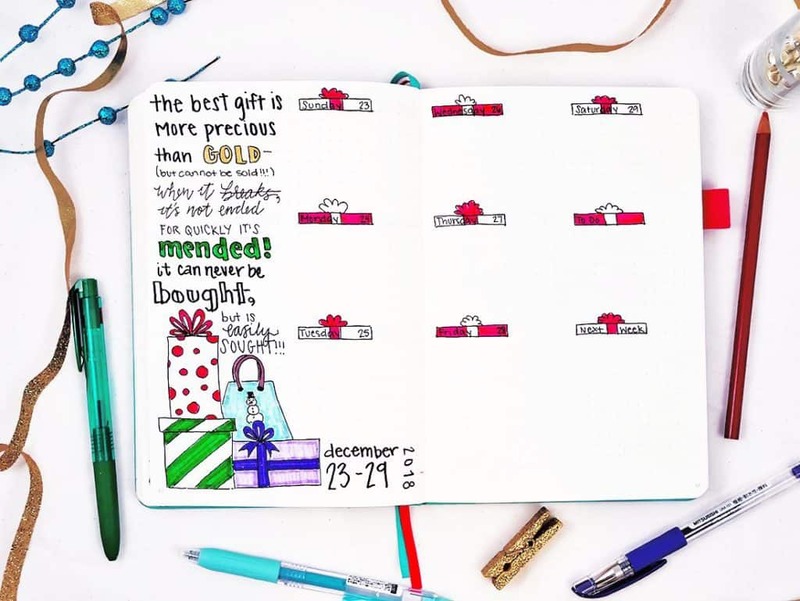 Personally, this time of year is so much fun for getting to create beautiful bullet journal spreads. 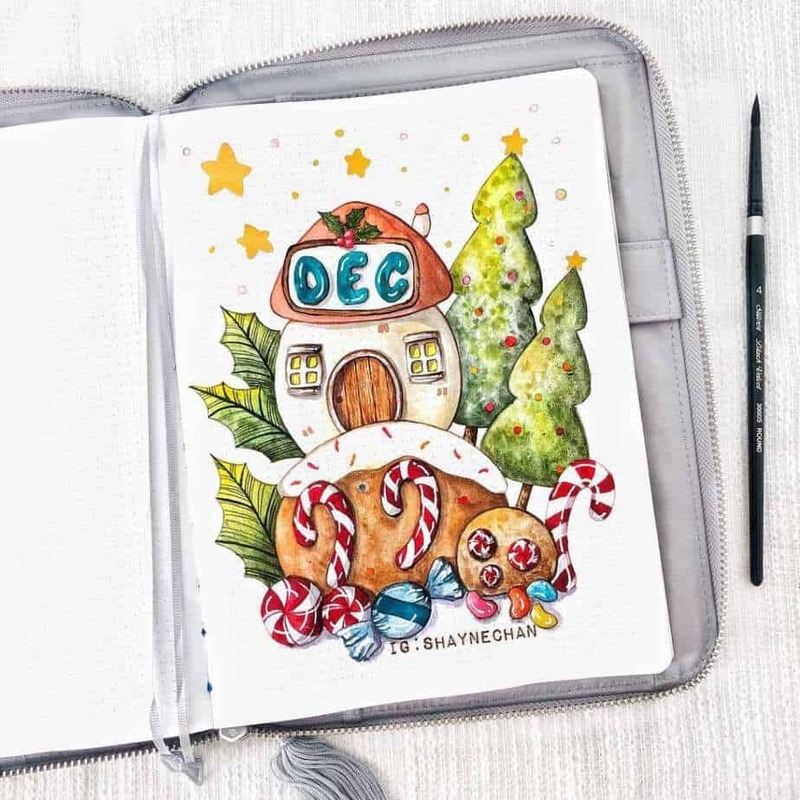 The holidays hold a lot of meaning for so many people, and there are lots of beautiful traditions, doodles, and ideas that reflect the meaning of the season. Last year, I created this theme for December and had a blast creating it. I wanted to see if I could do it again without being redundant. Check out what I created, along with tons of inspirational setups from my followers on Instagram, too! 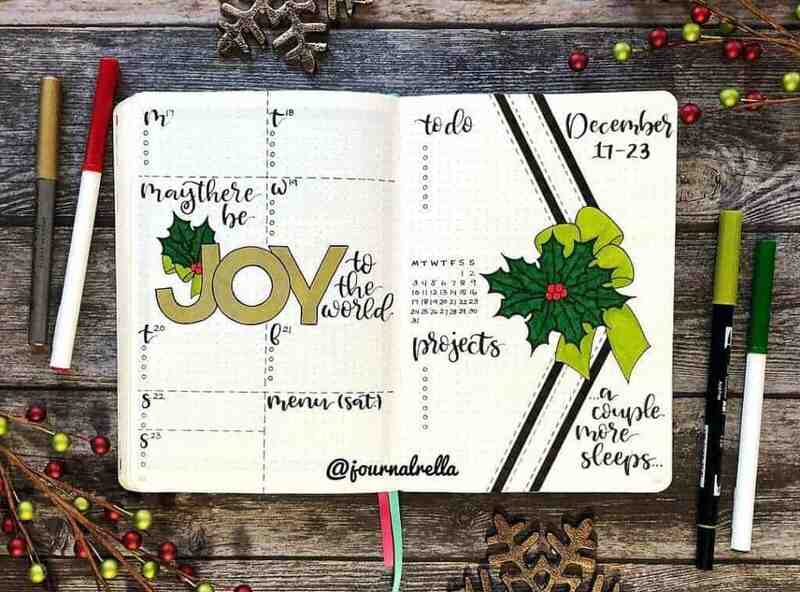 My bullet journal holiday theme cover page for 2018 is so beautiful and simple. I decided on a simple cover page because this time of year is busy enough, and some of the other monthly setups already take a little extra time. So how did I go simple for my holiday theme? I chose to do a cute little snow bunny doodle I found online! I added my own variation on the doodle and colored it in with my Tombow Dual Brush Pens. 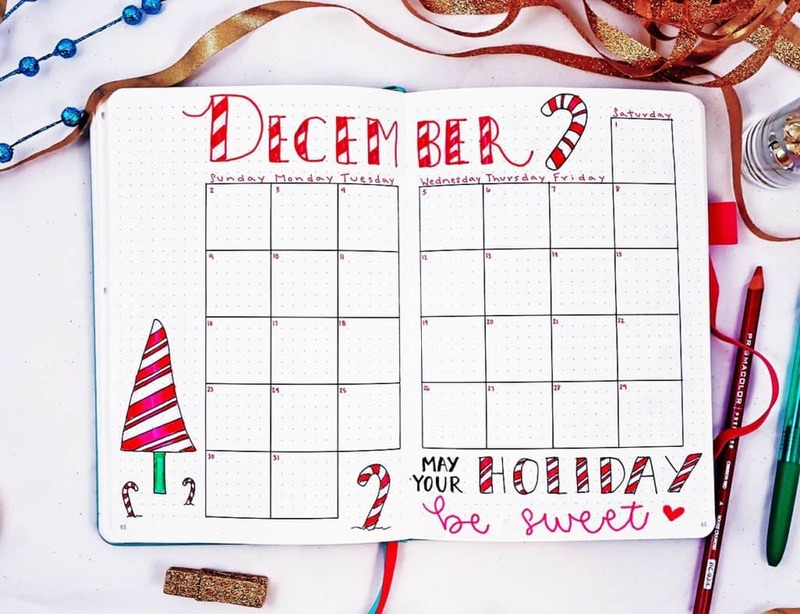 For this month I went with a traditional monthly calendar layout, leaving room on the sides and bottom for these super cute peppermint doodles! I thought the peppermints were super fun, and I learned some great techniques to give them more of a 3D appearance. Even better? You can do lettering in a peppermint style! Super fun and inventive. 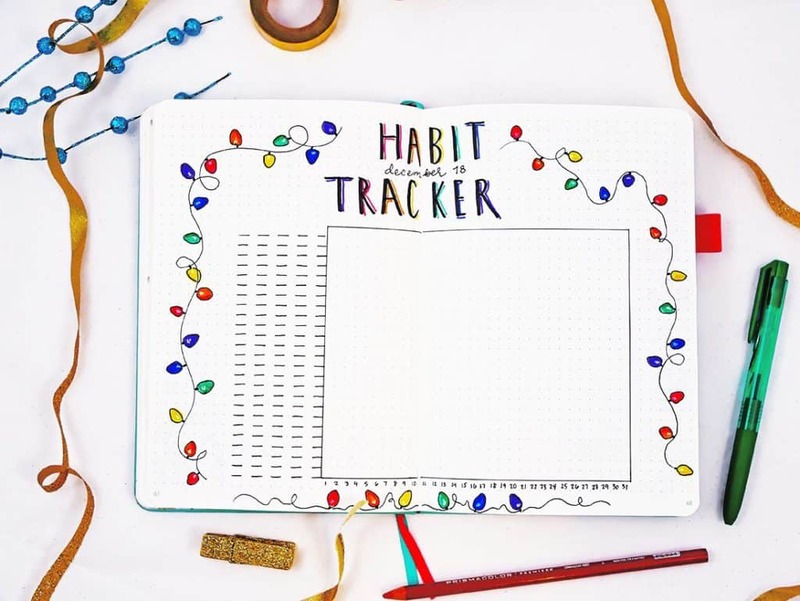 I really like the 2-page habit tracker layout because it gives me plenty of room for decoration without fear of eating up an entire page (permitting I only used one). 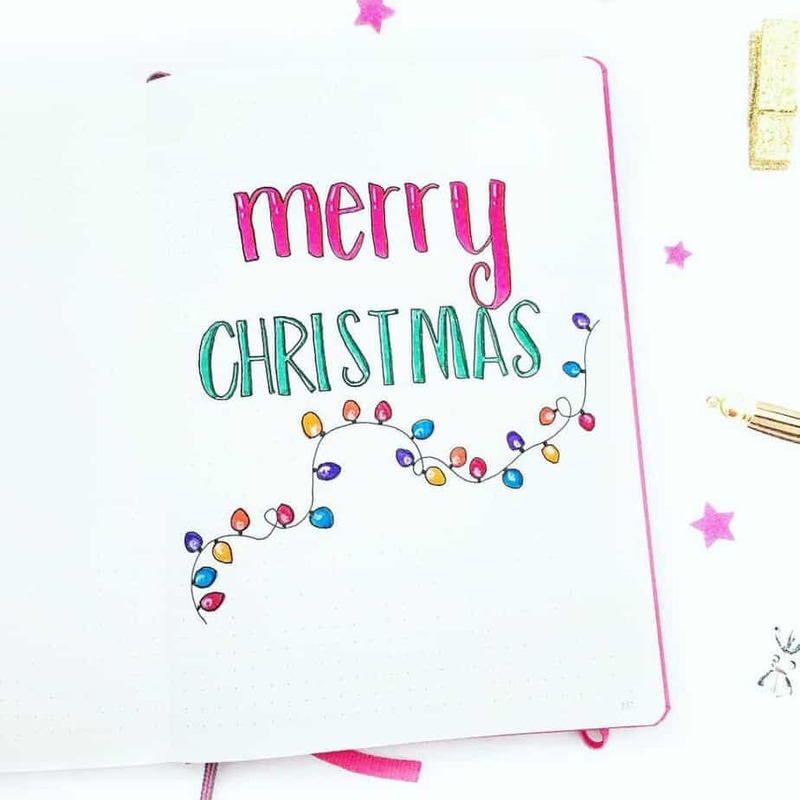 Christmas light doodles are always great because they are very easy and fun to create! I actually used a similar template with my ‘Merry Christmas’ page from 2017, only changing up the length of the Christmas lights. 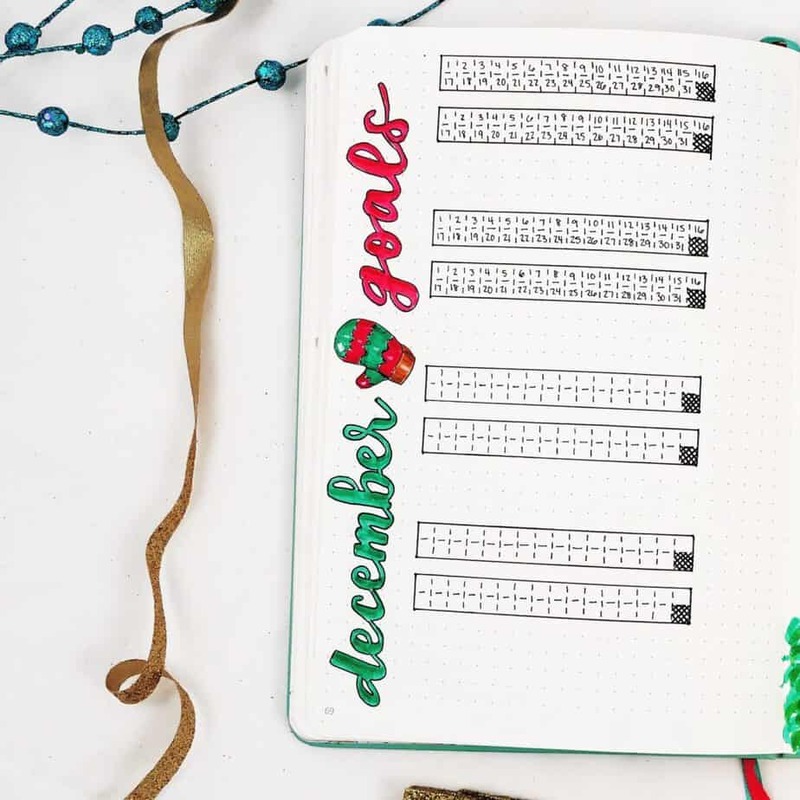 How can you pass up the holiday season without a super fun mood tracker? 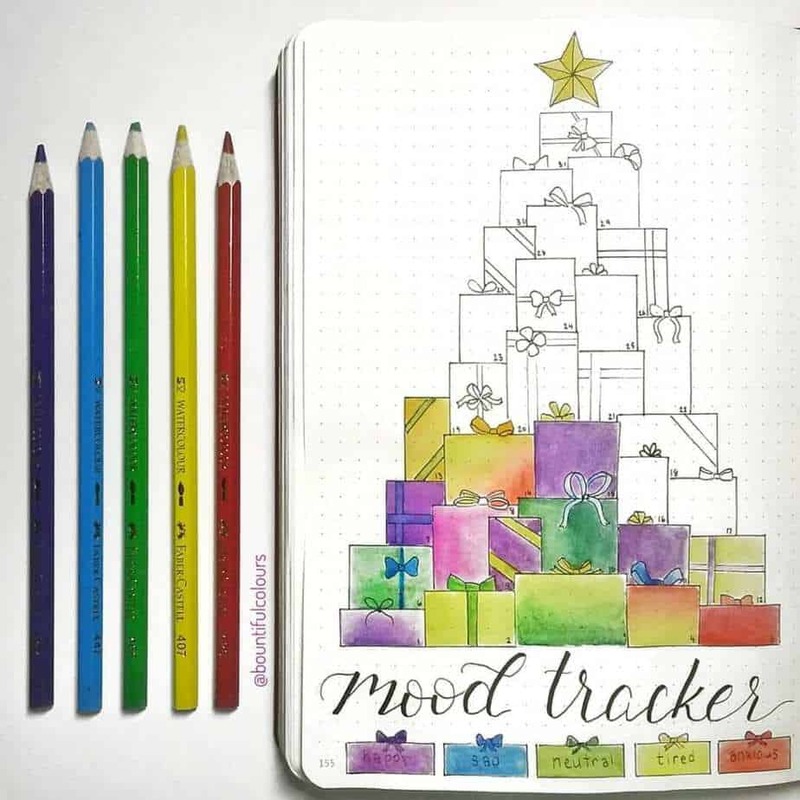 I always loved Christmas tree mood trackers because you can decorate your mood in lights or fun ornament doodles! It’s really simple and straightforward, but perfect for the season! 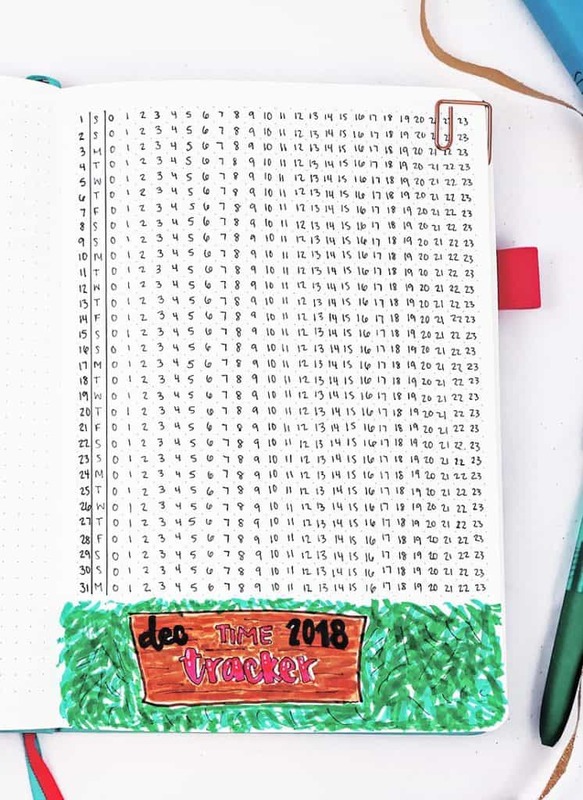 My time tracker didn’t quite turn out the way I was hoping, I was trying to get a ‘Christmasy’ wood sign nestled against evergreen, but you can’t always win on all of the bullet journal spreads you try to make! This style of a tracker is great for tracking time, by the way! It’s a very easy way to see how you spend your time every single day. 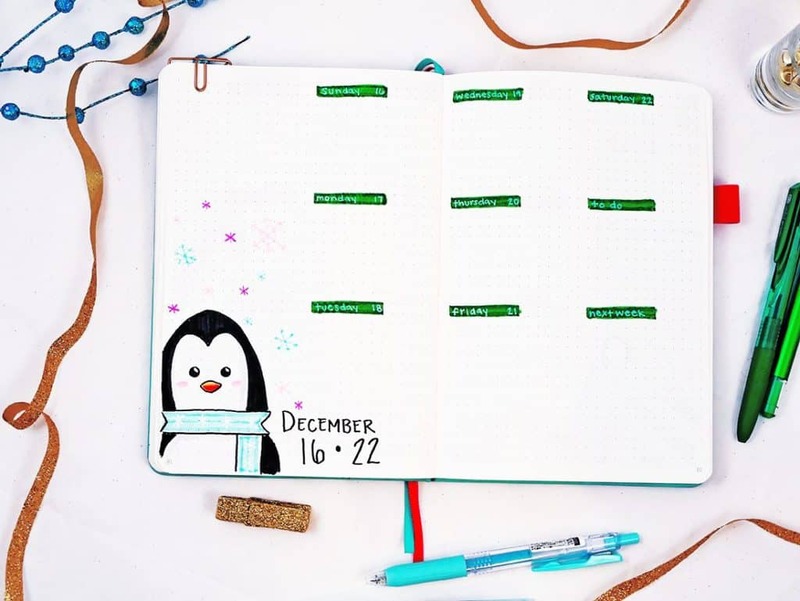 The goal tracker layout is relatively generic but left a lot of space to decorate with all sorts of cute, wintery supplies! 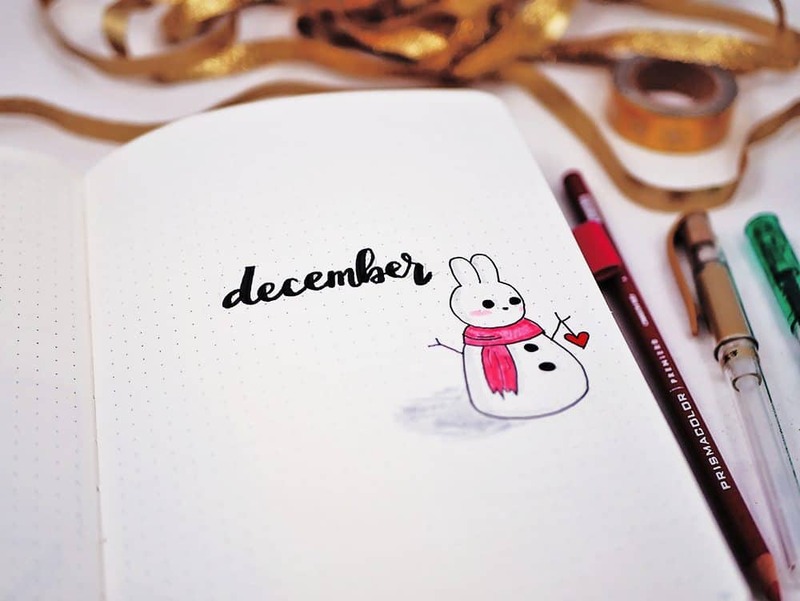 Hats, scarves, and mittens are incredible doodles perfect for a bullet journal holiday theme! Since I wanted to keep it simple but have fun, I went with a very straightforward weekly layout setup, and left a lot of room for fun holiday theme doodles! Here are the weekly spreads I created for the holiday theme! For the first week, I found a super cute, alternative style tree on Pinterest that I wanted to create my own spin on! I set up the tree, and then added all kinds of beautiful bulb ornaments to decorate. The real highlight of this particular doodle was actually using my gold pen to give some of the ornaments and the star some extra sparkle! For the second week, I had to go back to the peppermint doodles again. They were just too cute, and I wanted to master the shading so they would have a 3D effect. 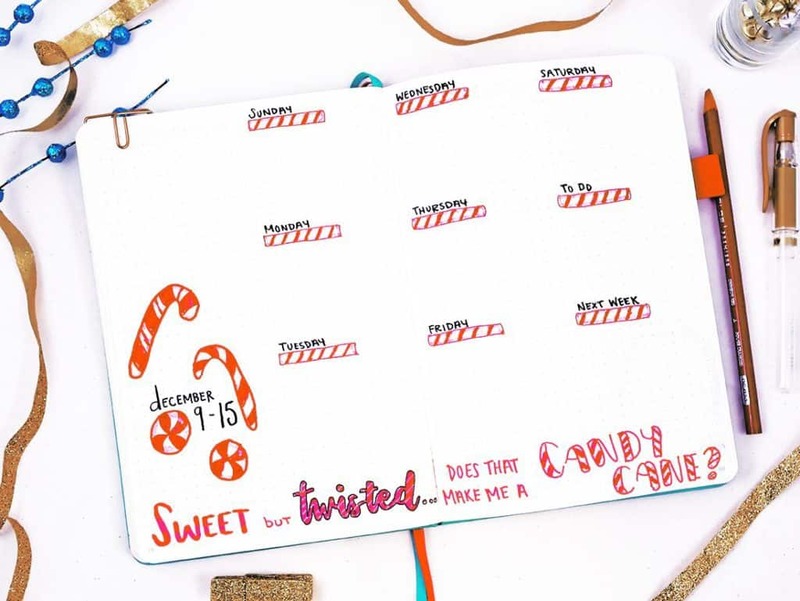 I made different types of candy cane doodles as well, from simple sticks, to peppermint balls, and of course the ever stylish old-fashioned candy cane! For the third week, I chose to go with a winter animal. For some reason, penguins always come to mind as a great wintery animal, so I made this super cute penguin doodle, complete with winter scarf. 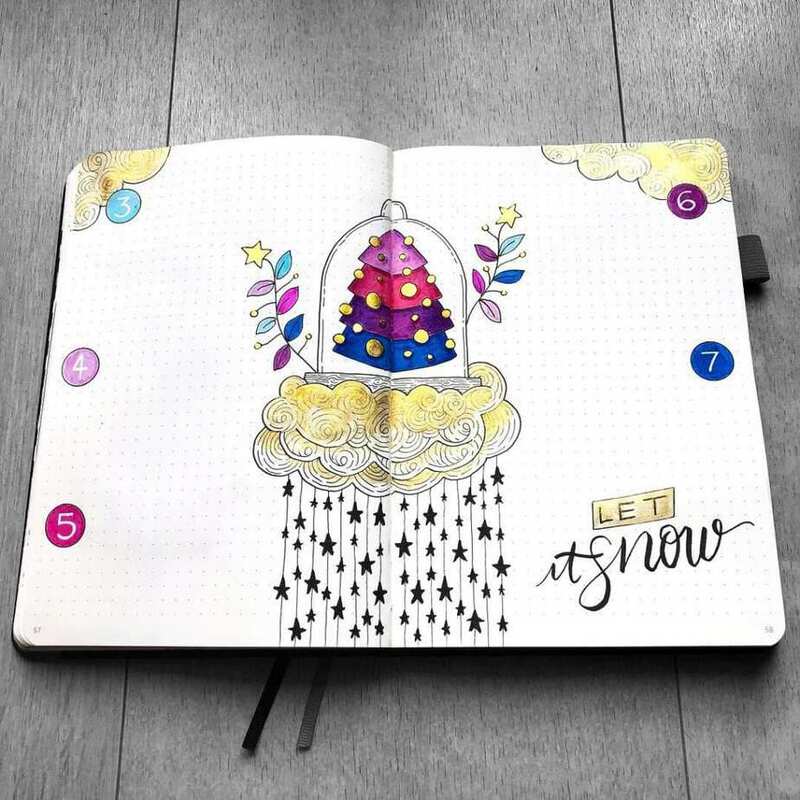 I added some multi-colored snowflakes with my Zebramildliners for an added touch. “The best gift is more precious than gold, but it cannot be sold. When it breaks, it’s not ended, for quickly it’s mended. By the way, present doodles are phenomenal. Sure, they are simple boxes, but you can add a lot of variety! 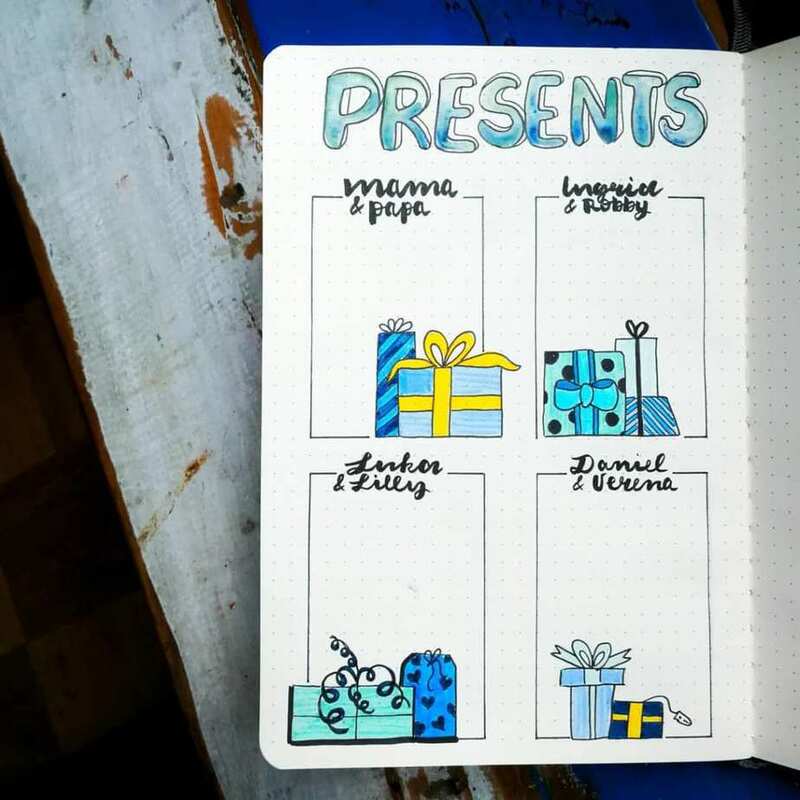 From the size, color, and shape, you can make a lot of different types of presents with very straightforward doodles! As an added touch, I even made present doodles for the boxes that organize the layout! Once again, the monthly review is a great time to reflect over the month so I can make changes and modifications for the following month. I went with a two-page template this time because when I do actually fill these out, I always feel cramped trying to write everything in just one page. Besides my doodle failing at life a bit (I had a hard time connecting holiday and unicorn theme), I am excited to see if the two-page layout is better! 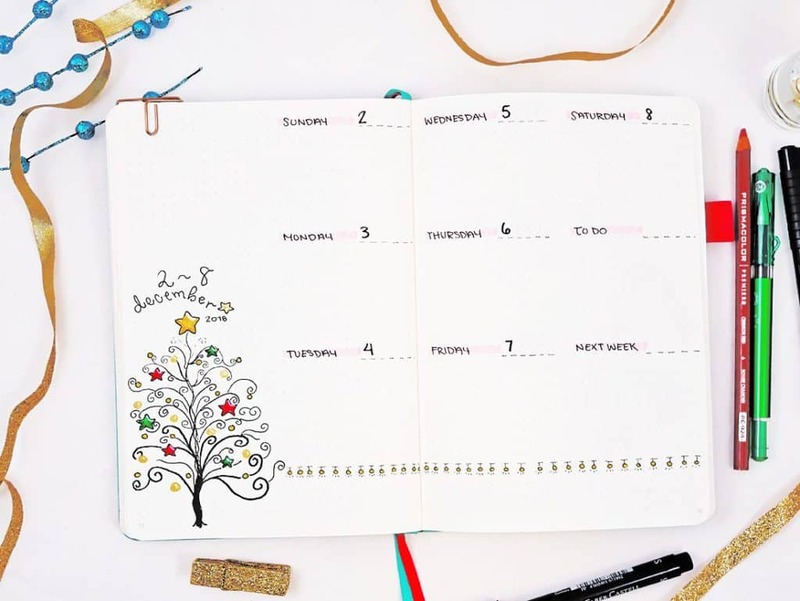 Since it’s likely you’re celebrating this month, there are some excellent miscellaneous bullet journal layouts you can include in your setup! I wanted a place where I could write down what I was getting people for Christmas. 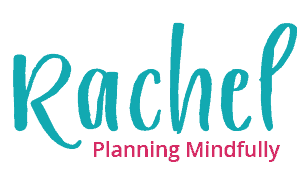 It’s simple, straightforward, and and I even included space for budgeting! Nothing less fun than going to send out Christmas cards and having to spend forever hunting down addresses. 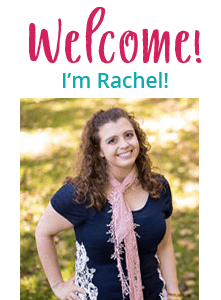 A card tracker allows me to organize who is getting cards, their addresses, and whether letters have been sent out all in one convenient place! 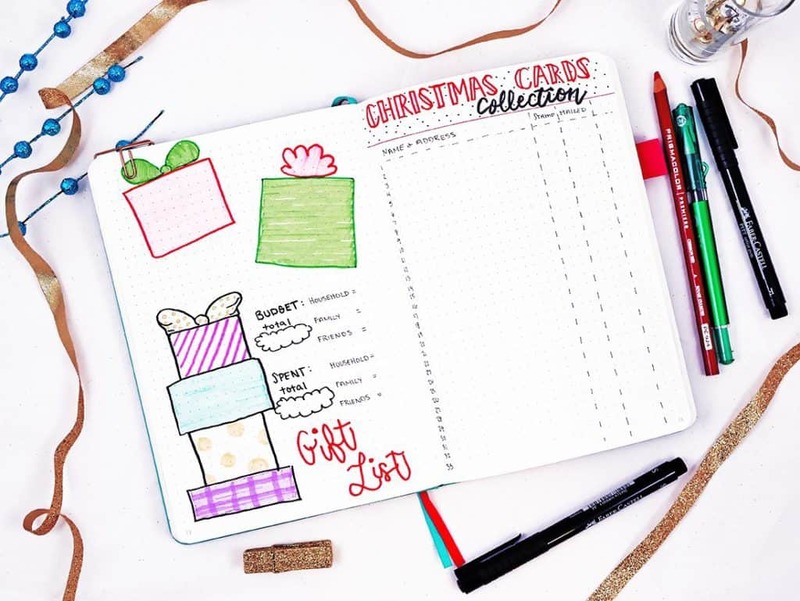 For a fun alternative, you could also do a received Christmas Card Tracker much in the same way! Ok, this one isn’t totally necessary- but I wanted something to share on Instagram for Christmas! It’s cute and very simple. Here is the one that I made in 2017! 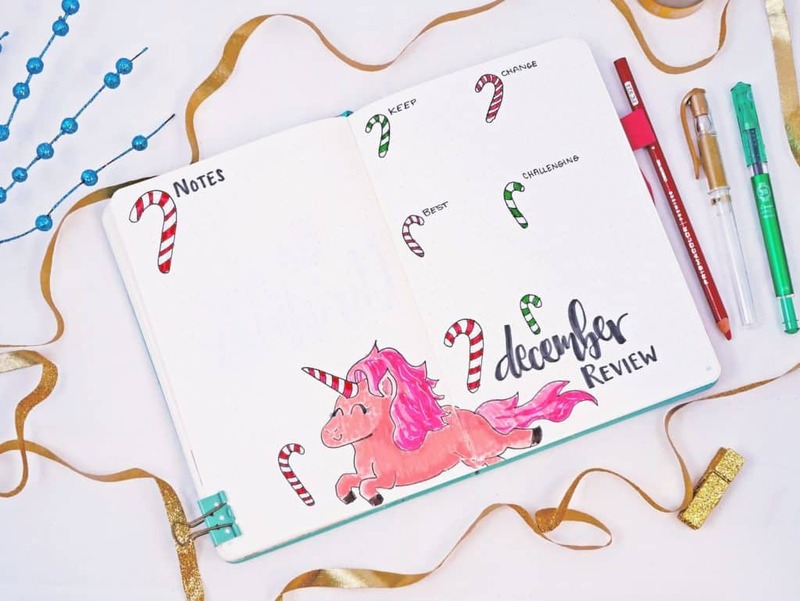 Looking for more ways to decorate your bullet journal for Christmas? 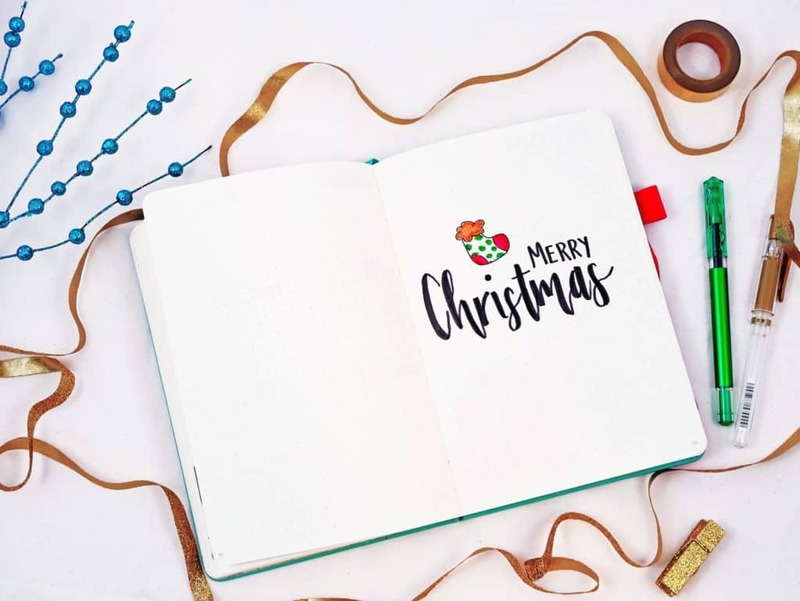 Read 7 Jolly Bullet Journal Ideas for Christmas. I loved that there is an idea for everything. 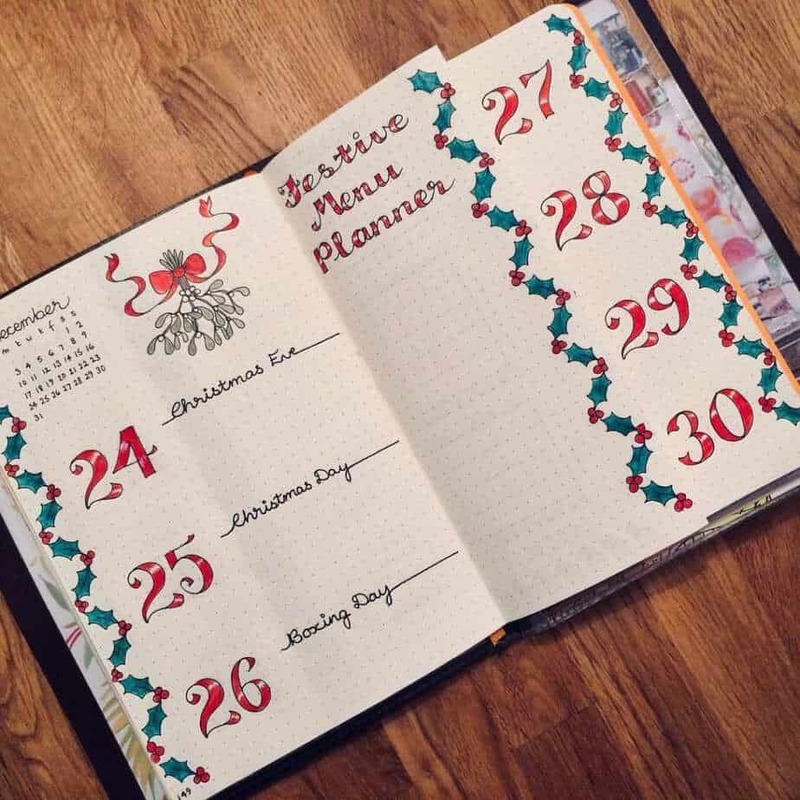 Whether you want to do a traditional Christmas set up, you celebrate a different holiday (Hannakuh, Solstice, Kwanzaa) or if you prefer to keep your holiday less religious, you can find all sorts of great ideas for doodles and layouts all over Instagram and Pinterest. I also enjoyed that there are some special layouts you can include with this theme because it correlates with the season. Honestly, I don’t think I disliked anything about this theme! I will definitely be doing it again next December, and it’s awesome that I can give it a totally different look! 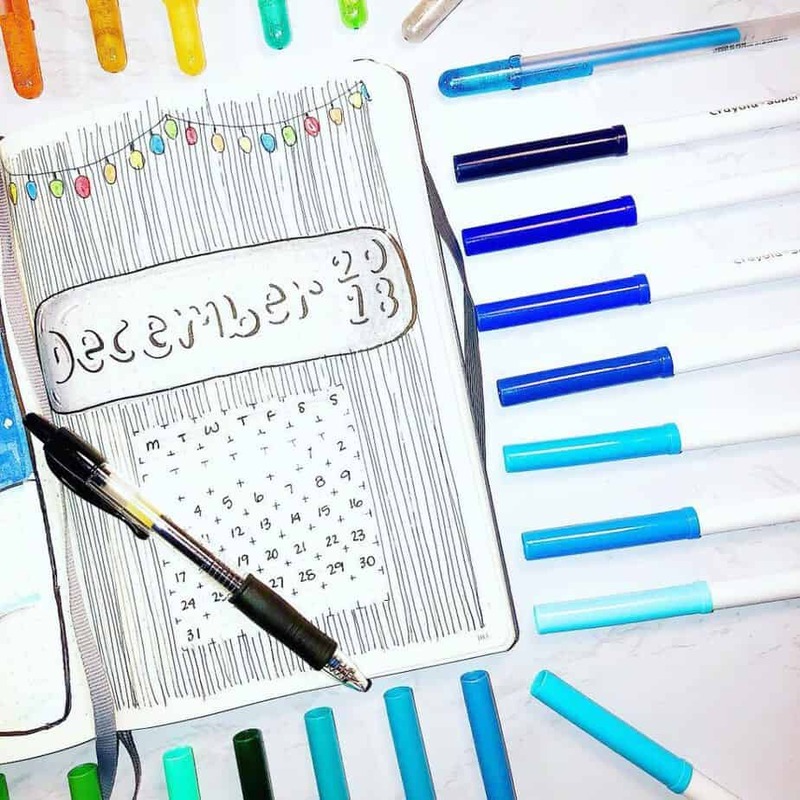 Everybody everywhere is making beautiful bullet journal holiday theme layouts, and here are just a handful from my followers on Instagram! Overall, I rate the holiday theme a 10/10. It’s an easy theme with lots of variety and variability. 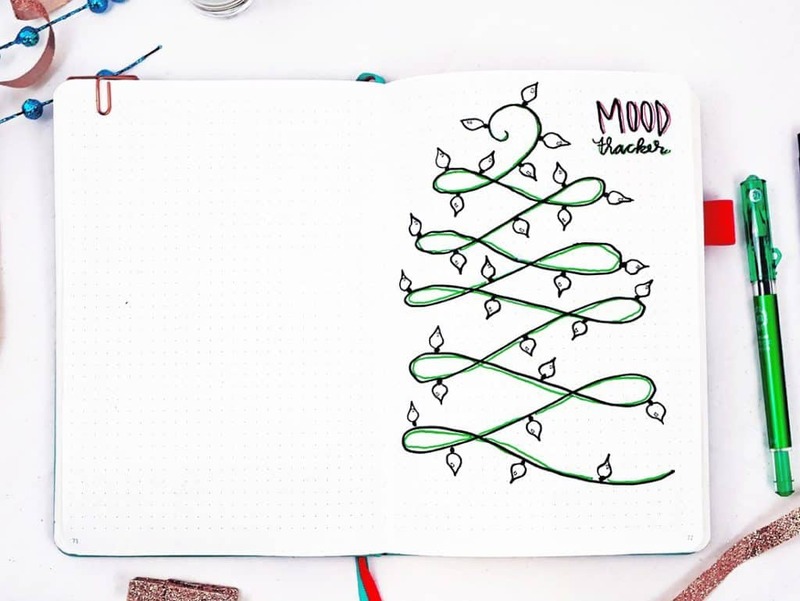 Doodles are as simple as you want them to be and very easy to incorporate into any type of layout setup you choose with your bullet journal. 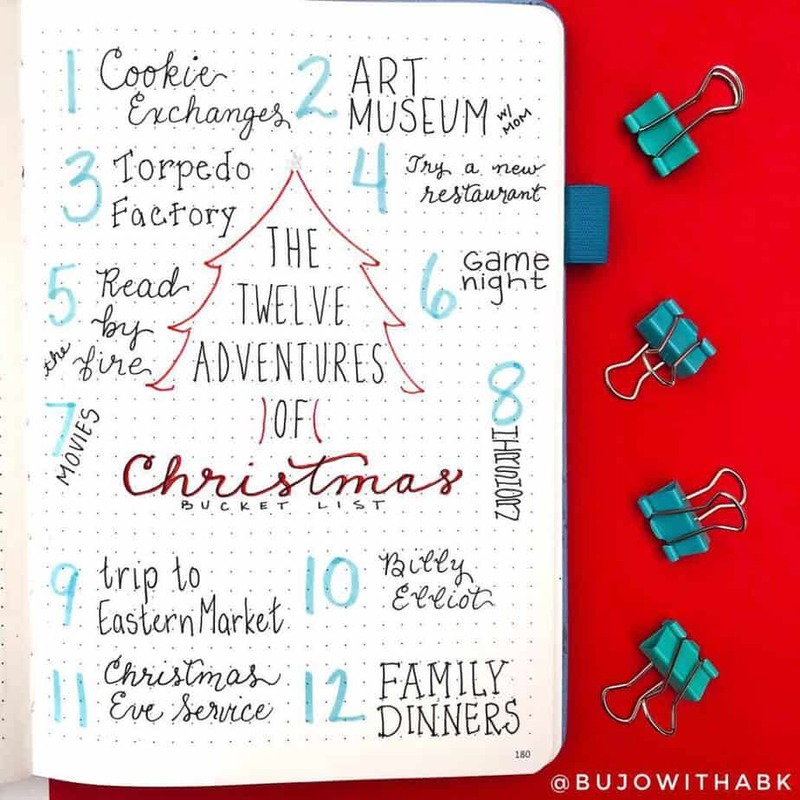 Did you have a holiday theme in your bullet journal this year? What is your favorite part about the holiday theme spreads? Tell me in the comments! 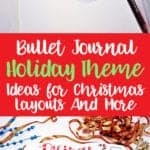 Looking for bullet journal ideas for Christmas gifts? 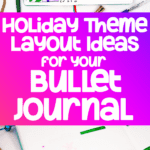 Check out the Deluxe Bullet Journal Gift Guide! Did you get inspired for the holidays? 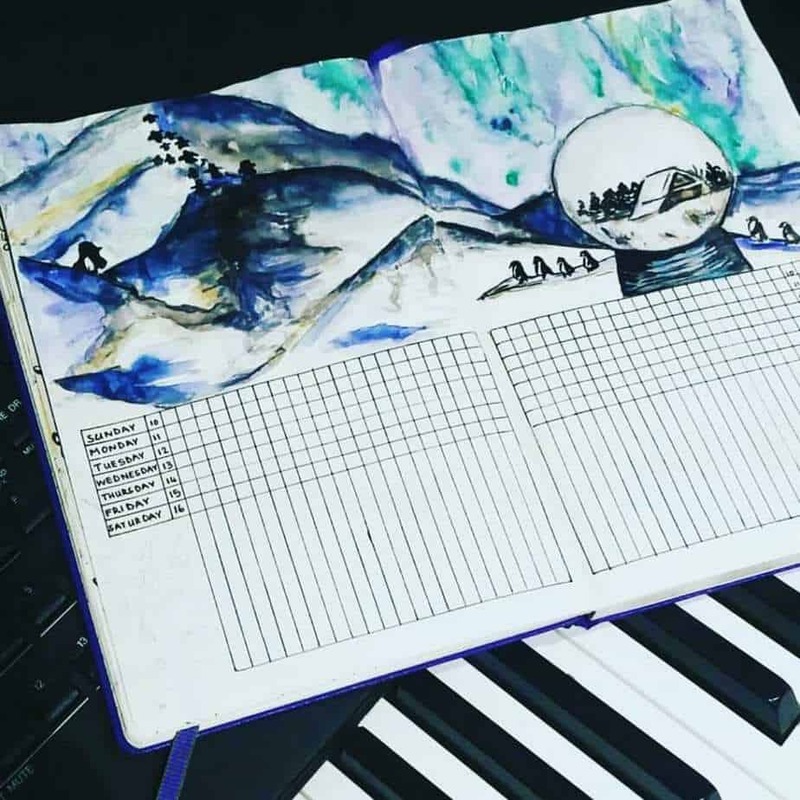 This year just blew me out of the water, but one think I know I want to get back to in 2019 is Bullet Journaling. There are some wonderful ideas here! Thank you, and your other readers, for sharing your creativity with us all!